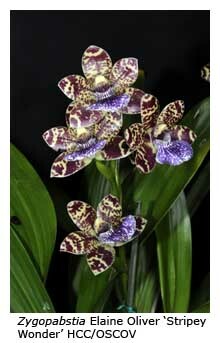 Zygopetalums are cool-growing South American orchids that grow under similar conditions to those suitable for cymbidiums. Flowering spikes develop with the new leaves and usually carry four to eight highly perfumed, long lasting flowers with distinctive mauve or purple patterned lips. Although about fifteen species are known in nature, only three or four are commonly grown. 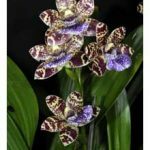 However, many more zygopetalum hybrids are available, together with an increasing number of inter-generic hybrids produced by hybridising Zygopetalum with related genera, such as Pabstia (Colax) and Promenaea. 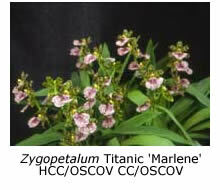 These hybrids often flower twice yearly. 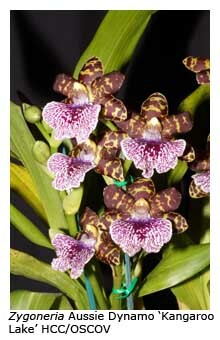 An open potting mix, similar to that used for cymbidiums, is suitable. Most growers use pine bark (5-10 mm), sometimes with additives such as peanut shells, rice hulls or river pebbles. Black plastic pots with plenty of drainage holes are ideal. It’s a good idea to re-pot every two years, because the fleshy roots soon deteriorate in an old, decaying potting mix. Zygopetalums seem to prefer a slightly shadier environment than cymbidiums, their leaves becoming yellow and burning if the light is too intense. 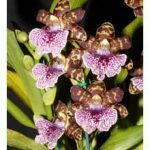 They grow well with cymbidiums, especially if they are placed on a lower shelf, where they are slightly shaded by cymbidium leaves. However, they must not be relegated to a spot under the benches, as they require airy conditions. Their leaves must not remain wet for long after watering, especially in winter. Cold, damp conditions can lead to the development of unsightly black spots on the leaves. The potting mix must not be allowed to become excessively dry, and frequent watering, especially in summer, produces best results. However in winter, which corresponds to the rest period (time of least growth) in their natural habitat, the plants should be kept fairly dry. Water no more often than once each week at this time and avoid wetting the foliage to reduce the occurrence of leaf spotting. 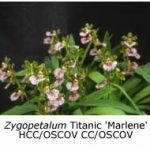 Zygopetalums may be fertilised in two different ways or by a combination of both. One option is to apply granules of a slow-release fertiliser, such as Osmocote-Plus®, to the top of the mix in October – then shake the pot so that the fertiliser enters the mix. The other is to apply a weak solution of a liquid fertiliser at fortnightly intervals between September and May. Use at only half of the manufacturer’s recommended concentration. Potassium-rich fertilisers, such as Campbell’s A®, generally result in better flowering.